High mobility group box (HMGB) proteins are nuclear nonhistone chromosomal proteins that bend DNA, bind preferentially to distorted DNA structures, and promote the assembly of site-specific DNA binding proteins. Recent reports indicate that HMGB1 has a dual function, a cytokine in addition to a nuclear protein. The increased expression of HMGB1 has been reported for several different tumors. Here, we assessed HMGB1 and HMGB2 expressions in two cases of papillary renal cell carcinoma. One case with pT1a, Grade 2 showed HMGB1 expression in the nucleus and cytosol and HMGB2 expression in the nucleus, but not in the cytosol. In the other case, there were three renal tumors, one of which was clear cell renal cell carcinoma with pT1a, Grade 3 and two were papillary renal cell carcinomas, Grade 2 (5 mm and 2 mm in the diameter). 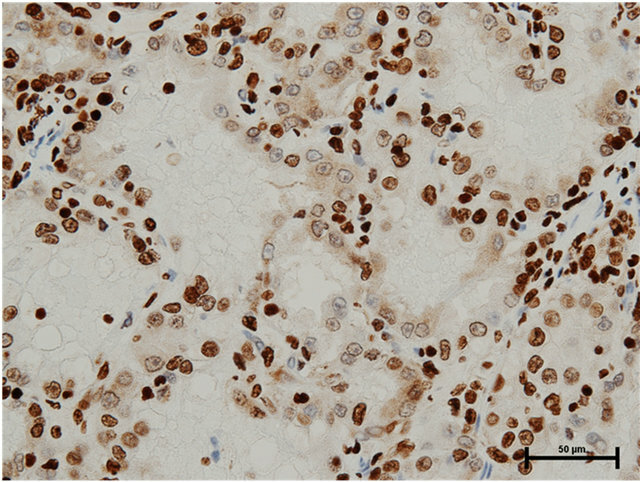 Both HMGB1 and HMGB2 were expressed in the nucleus and cytosol of papillary carcinoma. 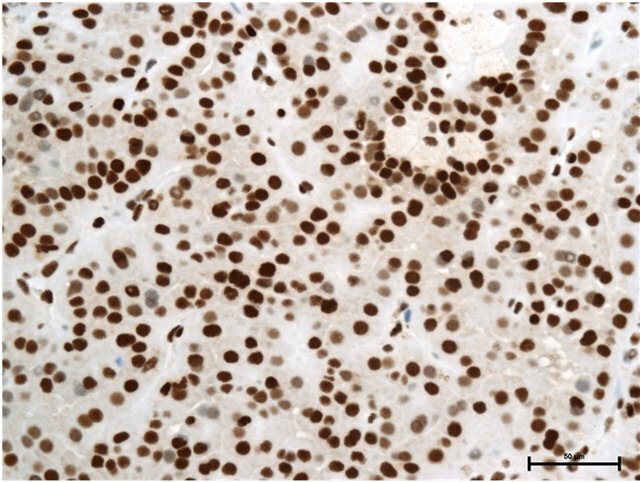 In the clear cell carcinoma of this case, HMGB1 expression was stained both in the nucleus and cytosol, while HMGB2 was observed in the nucleus, but not in the cytosol. More samples need to be further investigated in order to draw conclusions concerning HMGB expressions in papillary renal cell carcinomas. High mobility group box (HMGB) proteins are nuclear nonhistone chromosomal proteins that bend DNA, bind preferentially to distorted DNA structures, and promote the assembly of site-specific DNA binding proteins leading to the regulation of gene transcription . HMGB1 has been regarded as a ubiquitous nuclear protein with an architectural function, although HMGB2 and HMGB3 expressions are relatively restricted. However, recent reports indicate that HMGB1 expression can be outside of the nucleus, and so it is not a housekeeping protein but has a dual function , a cytokine in addition to a nuclear protein. The receptor for advanced glycation end products (RAGE), Toll-like receptor-2 (TLR-2), and Toll-like receptor-4 (TLR-4) is known as a receptor of HMGB1  and extracellular HMGB1 is an inflammation mediator and a danger signal . On the contrary, Kusume and colleagues reported that HMGB1 produced by colon cancer cells disturbed anticancer immunity in the host by suppressing nodal dendritic cells . The increased expression of HMGB1, particularly in conjunction with RAGE, has been reported for several different tumors, including colon cancer , breast cancer , melanoma , prostate cancer [8,9], and gastrointestinal stromal tumors , often indicating invasiveness, metastasis, and a poor prognosis [11,12]. HMGB2 has not been reported to come out of the nuclus or cells differently from HMGB1. Ubiquitous expressions of HMGB1 and HMGB2 have the potential to regulate the transcriptional activity of different members of the p53 family in cell-specific and promotor-specific manners in vivo . Both HMGB1 and HMGB2 are sensors of DNA damage inducing a p53-mediated DNA damage response, abrogation of which increased chemoresistance in some cancer cell lines . Recently, we have examined immunohistological expressions of HMGB1 and HMGB2 in surgically resected human clear cell renal cancer specimens . There, HMGB1 was expressed in the nucleus in 93.9% of clear cell renal cancers, while its expression in the cytosol was noted in 48.5%. Cytosolic HMGB1 is expressed more frequently in cancers beyond the pT1b classification than in those at the pT1a classification. Higher tumor grades (G2≤) were also significantly linked with the cytosolic expression of HMGB1. HMGB2 was expressed in the nucleus in 87.9% of clear cell renal cancers, while its expression in the cytosol was observed in only 15.2%. Accordingly, we have concluded that HMGB1expressed in the cytoplasm was correlated with poor pathological characteristics. In this line, we assessed HMGB1 and HMGB2 expressions in two cases of papillary renal cell carcinoma. Kidney cancer genes known to be involved in the pathogenesis of the renal tumors are VHL (von HippelLindau), MET (hepatocyte growth factor receptor), FLCN (folliculin), TSC1/TSC2 (tuberous sclerosis genes), FH (fumaratehydratase), and SDH (succinate dehydrogenase) . Papillary renal cell carcinoma is the second most common subtype of RCC next to the clear cell subtype and activating mutations in the tyrosine kinase domain of MET have been detected in the hereditary and sporadic type 1 papillary renal cell carcinomas . Paraffin-embedded sections of specimens of renal cancers excised by radical or partial nephrectomy were histochemically stained with anti-human mouse monoclonal HMGB1 antibody (Abcam, AB80246) or anti-human mouse monoclonal HMGB2 antibody (Abgent, AT2387a) as primary antibodies essentially following the manufacturers’ instructions. Expressions of HMGB1/2 were determined by a single pathologist (A.T.). Case 1: Seventy-five year old male presented with incidentally found right renal tumor. An enhanced CT scan revealed almost non-enhanced tumor of 3 cm in the diameter in the dorsal portion of left kidney without metastasis. Partial nephrectomy was performed through left flank incision with clamp of the right renal artery for 20 minutes following surface cooling with ice slush. The pathology of the renal tumor was renal cell carcinoma of papillary subtype, pathological T1a, Grade 2. 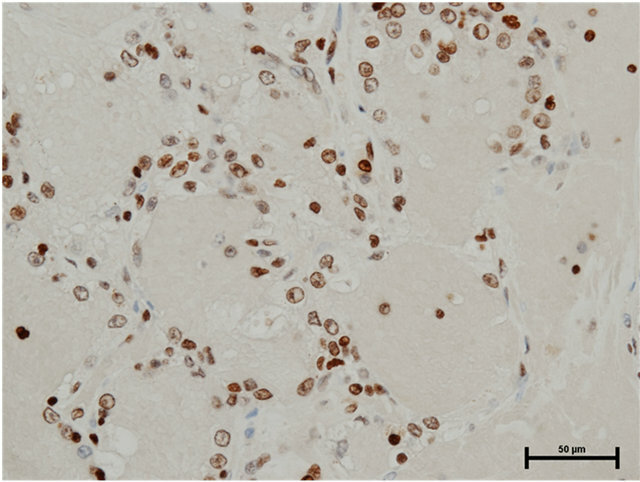 Staining with anti-HMGB1 and anti-HMGB2 antibodies showed HMGB1 expression in the nucleus and cytosol (Figure 1(a)) and HMGB2 expression in the nucleus, but not in the cytosol (Figure 1(b)). Case 2: Seventy-eight year old male presented with incidentally found left renal tumor. An enhanced CT scan revealed heterogeneously enhanced tumor of 3.8 cm in the diameter in the middle of left kidney without metastasis. Left nephrectomy was performed through left flank incision. In the pathology, there were three renal tumors, one of which was clear cell renal cell carcinoma, Grade 3 indicated by the CT scan and the remaining two were papillary renal cell carcinomas, Grade 2 (5 mm and 2 mm in the diameter). The latter tumors were located separately from the main clear cell cancer. Both HMGB1 and HMGB2 expressions in the cytosol as well as the nucleus of papillary renal cell carcinomas were observed (Figures 2(a) and (b)). 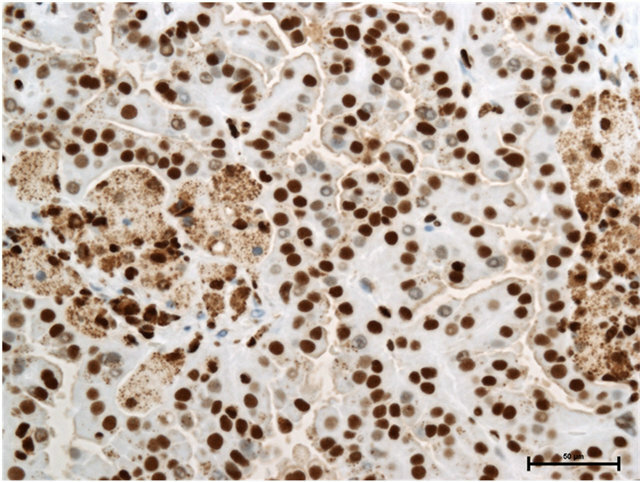 In the clear cell carcinoma, HMGB1 expression was stained both in the nucleus and cytosol (Figure 3(a)), while HMGB2 was observed in the nucleus, but not in the cytosol (Figure 3(b)). Figure 1. 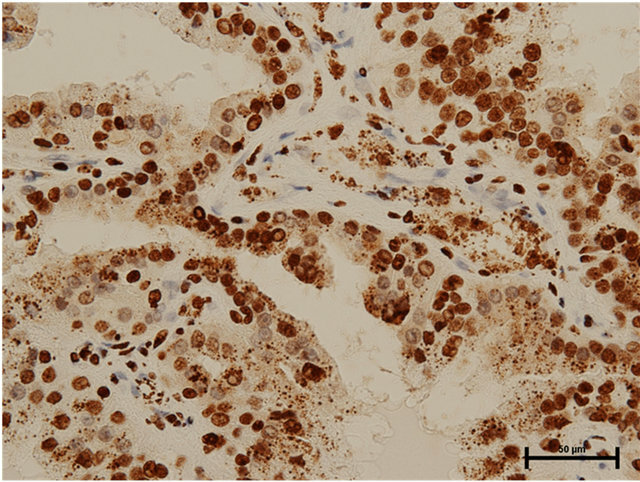 (a) HMGB1 staining in papillary renal cell carcinoma in Case 1. Nuclear staining+, cytoplasmic staining+, Bar = 50 μm; (b) HMGB2 staining in papillary renal cell carcinoma in Case 1. Nuclear staining+, cytoplasmic staining−, Bar = 50 μm. Figure 2. 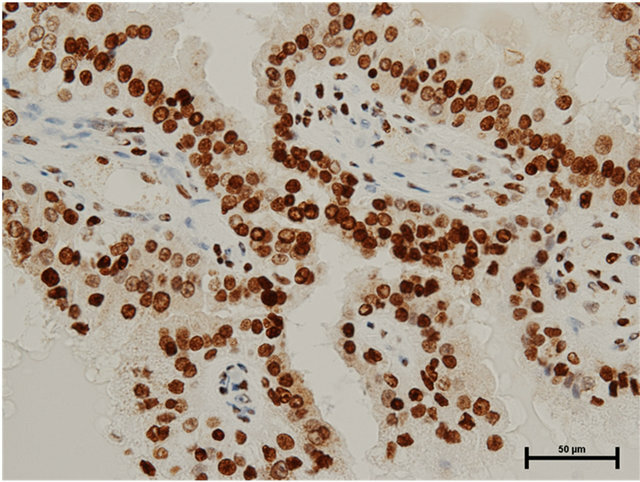 (a) HMGB1 staining in papillary renal cell carcinoma in Case 2. Nuclear staining+, cytoplasmic staining+, Bar = 50 μm; (b) HMGB2 staining in papillary renal cell carcinoma in Case 2. Nuclear staining+, cytoplasmic staining+, Bar = 50 μm. shows that HMGB1 tends not to be expressed in pT1a tumors, there may be tendency that papillary renal cell carcinomas even in the lower stage express HMGB1. Papillary renal cell carcinomas are generally smaller and have fewer metastases at diagnosis compared with clear cell renal cell carcinomas with similar or favorable cancer specific survivals [17,18]. Papillary renal cell carcinomas are further differentiated into type 1 and type 2 with the latter having significant lymphovascular invasion and poorer prognosis . Clearly, the two cases in the present study seem to be type 1 papillary renal cell carcinomas with their histology. Figure 3. (a) HMGB1 staining in clear renal cell carcinoma in Case 2. Nuclear staining+, cytoplasmic staining+, Bar = 50 μm; (b) HMGB2 staining in clear renal cell carcinoma in Case 2. Nuclear staining+, cytoplasmic staining−, Bar = 50 μm. HMGB family. In our previous report analyzing 33 cases, cytosolic HMGB2 expression in clear cell renal cell carcinomas could not show linkage with T classifications/ tumor grades, but there proved to be a weak linkage between them by increasing the sample size (unpublished data). Of course, more samples need to be further investigated in order to draw conclusions concerning HMGB expressions in papillary renal cell carcinomas. M. L. Brezniceanu, K. Völp, S. Bösser, C. Solbach, P. Lichter, S. Joos and M. Zörnig, “HMGB1 Inhibits Cell Death in Yeast and Mammalian Cells and Is Abundantly Expressed in Human Breast Carcinoma,” The FASEB Journal, Vol. 17, No. 10, 2003, pp. 1295-1297. H. Kuniyasu, Y. Chihara, H. Kondo, H. Ohmori and R. Ukai, “Amphoterin Induction in Prostatic Stromal Cells by Androgen Deprivation Is Associated with Metastatic Prostate Cancer,” Oncology Reports, Vol. 10, No. 6, 2003, pp. 1863-1868. M. Gnanasekar, S. Thirugnanam and K. Ramaswamy, “Short Hairpin RNA (shRNA) Constructs Targeting High Mobility Group Box-1 (HMGB1) Expression Leads to Inhibition of Prostate Cancer Cell Survival and Apoptosis,” International Journal of Oncology, Vol. 34, No. 2, 2009, pp. 425-431. Y. R. Choi, H. Kim, H. J. Kang, N. G. Kim, J. J. Kim, K. S. Park, Y. K. Paik, H. O. Kim and H. Kim, “Overexpression of High Mobility Group Box 1 in Gastrointestinal Stromal Tumors with KIT Mutation,” Cancer Res, Vol. 63, No. 9, 2003, pp. 2188-2193. M. Waldert, A. Haitel, M. Marberger, D. Katzenbeisser, M. Ozsoy, E. Stadler and M. Remzi, “Comparison of Type I and II Papillary Renal Cell Carcinoma (RCC) and Clear Cell RCC,” BJU International, Vol. 102, No. 10, 2008, pp. 1381-1384.